Dry cough is one of the two types of cough that is not associated with any phlegm or mucus. This cough is closely linked with tickly cough. It manifests due to infection of flu, cold, allergies and dusts. Sometimes the pharynx becomes inflamed resulting in dry coughs. People experience pain in the chest, tonsils and change in the voice which damages the voice box due to coughing over a long period of time. Dry coughs can be irritating and are normally the symptoms of any other problem. It does not affect people of a particular age but rather it affects people of all ages. Dry cough can be troubling to the person experiencing it and it is annoys the person next to them. Some people experience more dry coughing only during night thereby not permitting them to sleep. These infections are the most common forms of flu and cold. They generally occur at the start, middle or at the end of the fever. They may also stay even after the fever gets cured. Sometimes dry coughs remain due to prolonged sore throat. Human body is allergic to a variety of substances. Allergy occurs when the body immunity is susceptible to a certain substance and the body reacts to it. A common example of allergy is hay fever which is caused when people come into contact with pollen dusts. Some people are allergic to animal fur also. So coughs occur to react to it. Some people are allergic to smoke emanating from vehicles and factories and thus develop an aversion like cough towards it. 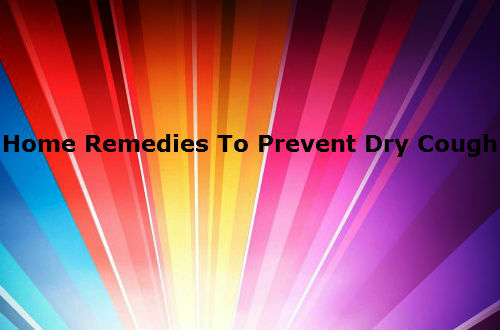 It has now been considered as one of the reasons for dry cough. The acid travels backwards to the back of the neck or pharynx and irritates it, thus resulting in dry coughs. These occur when we lie down. Sometimes dry coughs may be the result of a medication taken to cure a disease. These are very normal. Sometimes dry coughs occur without the person knowing it. This, sometimes becomes a habit and there is no physical implication associated with it. When people are stressed their lung tracts becomes too narrow so as to obstruct the air passage. As a result dry cough occurs. This is a disease which occurs periodically due to the swelling and blockage of air passageway in the lungs. This problem affects mostly people in the west. It is a condition in which heart fails and fluid and mucous gets accumulated in the lungs. So coughing occurs at night. Prolonged dry cough often results in the lung cancer. This is a bacterial disease associated with coughs and gasps of air with a whoop noise. This disease normally affects the lungs. Even though extinct for a period of time, it has now resurfaced. The main reason for dry cough is the drying of throat that causes irritation and itching in the pharynx. So we must drink water whenever we feel like coughing. This hydrates the body conditions. We may even drink any juice to suppress our dry cough. Sometimes eating spicy food results in excess irritation of the pharynx. So we must switch to organic food that does not cause itching. For example a spoon of honey when mixed and drunk with a little of warm water soothes the pharynx and stops dry cough. Drinking a bowl of soup can help soothe the tonsils and thereby relieving us from dry cough. The hotness and steam of the soup can help in attaining this. Certain herbs and their supplements like pines and mullens can help to soothe the throat thereby relieving from dry cough. Gargling with a cup of salt water for about three times a day can help us get rid of sore throat and irritation in the pharynx. Warm water must only be used. When sleeping at night we must sleep in such a way that enables us to breathe easily and sleep comfortably. We must make it a habit it sleep regularly in that posture. Sleeping with the face in an elevated position can help us breathe better. Proper rest at the proper time is an effective cure for almost all ailments. When we rest at the correct time our body develops immunity to fend all foreign antibodies and microbes.